Lyndon Baines Johnson was the 36th U.S. president. He served from 1963 to 1969. He was sworn in on November 22, 1963, two hours and nine minutes after President John F. Kennedy was assassinated. But by that time, he had earned a reputation as a powerful leader who knew how to get things done. You have LBJ to thank for Medicare, Medicaid, and Head Start. He championed the right for minorities to vote, buy homes, and go to school the same as whites. Johnson's Great Society program created the National Endowment for the Arts, the Public Broadcasting Corporation, and drivers' education. You also have him to thank for the scar of the Vietnam War, which he escalated but could not win. LBJ's increased government spending added $42 billion, or 13 percent, to the national debt. It was almost double the amount added by JFK, but less than a third of the debt added by President Nixon. Since Johnson, every president has increased the debt by at least 30 percent. It also boosted gross domestic product during Johnson's term. As a result, LBJ was one of the few presidents to avoid any recessions. The unemployment rate fell during the years he was in office. Soon after being sworn in, LBJ declared a War on Poverty. He used it to push through Kennedy's tax cut and civil rights bills. In his 1964 State of the Union address, Johnson announced the program's audacious goals. He stated, "Our aim is not only to relieve the symptoms of poverty, but to cure it and, above all, to prevent it." His first step was to sign the Revenue Act of 1964. It reduced income taxes, lowering the top rate from 91 percent to 70 percent. It reduced the corporate tax rate from 52 percent to 48 percent. It created the minimum standard deduction. According to the Tax Foundation, the cuts spurred the economy enough that revenue increased 33 percent. It rose from $94 billion in 1961 to $153 billion in 1968. On August 31, he signed the Food Stamp Act of 1964. It made the food stamp program permanent. It led to today's Supplemental Nutrition Assistance Program. In 1964, the Civil Rights Act ended Jim Crow laws that discriminated against blacks in the South. The Act outlawed segregation in housing, voting, education, and use of public facilities. In 1965, the Voting Rights Act protected blacks’ right to vote. The Economic Opportunity Act of 1965 established the Jobs Corps and the federal work-study program. These provide academic and career skills for students. It implemented JFK's concept of the Volunteers in Service to America, which became AmeriCorps in 1993. It also created the Head Start preschool program. It created the Office of Economic Opportunity to run the War on Poverty programs. Federal community action agencies managed both federal and state programs. These included social services, mental health, medical care, and job programs. Many states, especially in the South, opposed the expansion of federal power. The Housing and Urban Development Act of 1965 expanded funding for housing programs. It subsidized rent for the elderly and disabled. It also constructed low-income housing and public works projects. The Department of Housing and Urban Development was created as a cabinet-level department to manage all federal housing programs. It remains responsible for public housing and redevelopment of slums. The Elementary and Secondary Education Act of 1965 established Title I public school funding for poor neighborhoods. Its goal was to promote equity in education. In 2001, it became the No Child Left Behind Act. In 2010, it became the Every Student Succeeds Act. The War on Poverty was designed to reduce the racial wealth gap. Although the unemployment rate was only 5.5 percent, it was 25 percent for black youths. The percent of families living below the poverty threshold wasn't getting better. The number of children on welfare had doubled between 1950 and 1960 to 2.4 million. The programs successfully reduced poverty, according to a Columbia University study. Between 1967 and 2012, poverty rates declined from 26 percent to 16 percent of the population. Food stamps kept 4 million people out of poverty. The programs especially help those living in extreme poverty, defined as less than $2 a day. The Jobs Corps program increased participants' earnings by 12 percent and reduced crime. Medicare reduced medical expenses for seniors, while Medicaid did the same for the poor. In 1964, LBJ ran against Arizona Senator Barry Goldwater on a platform of building a Great Society. He outlined his vision on May 22, 1964, in the commencement speech at the University of Michigan. Here, Johnson asked the nation to move not only toward "the rich society and the powerful society but upward to the Great Society." With it, America would "end poverty and racial injustice." It changed the definition of the American Dream from one of opportunity to one that guaranteed well-being. Johnson won the presidency with 61 percent of the votes. It was the widest popular margin in American history. 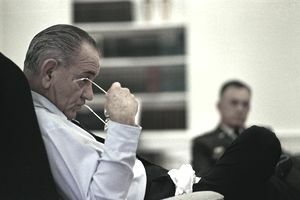 LBJ's election created Democratic majorities in both houses of Congress. This mandate allowed him to expand the federal government's role in both policies and funding. The Great Society covered education, healthcare, urban renewal and redevelopment, beautification, and conservation. It continued the War on Poverty. It also created new programs to prevent crime and delinquency. It required the states to meet federally designated minimum commitments. The Social Security Amendments of 1965 created Medicare and Medicaid. Medicare covered hospitalization for seniors. Medicaid provided health care for those below the poverty line. They also expanded Social Security benefits and increased the payroll tax cap and rates. The National Foundation on the Arts and Humanities Act of 1965 established the National Endowment for the Humanities and the National Endowment for the Arts. They fund research, publications, and programs on history, literature, and culture. President Johnson signed over 300 conservation measures into law. That formed the legal basis of the modern environmental movement. The Water Quality Act in 1965 set national water quality standards. The Motor Vehicle Air Pollution Control and Solid Waste Act of 1965 set standards to curb air pollution. It also funded solid waste disposal facilities. The Endangered Species Act of 1966 allowed the government to list and protect endangered species. The National Park Foundation Act of 1967 created a non-profit to help the National Park Service. The Highway Beautification Act of 1965 funded landscaping along the nation's highways. The Consumer Product Safety Commission and the Child Safety Act of 1966 created consumer product safety rules. The National Traffic and Motor Vehicle Safety Act of 1966 and the Highway Safety Act allowed the federal government to enforce safety standards for vehicles and highways. They required seat belts, side-view mirrors, and airbags. The Immigration and Naturalization Act of 1965 ended immigration quotas based on nationality, although retaining those based on country. It favored those with needed skills or who were joining families in the United States. That increased immigration from Asia and Latin America. LBJ's support of the space race allowed three astronauts to orbit the moon in 1968. He told them, "You've taken ... all of us, all over the world, into a new era. . ." He also negotiated the 1967 Outer Space Treaty. Both sides agreed they wouldn't claim the moon as their territory. In 1968, the Fair Housing Act ended legal discrimination in renting and selling homes. It was designed to reduce the racial homeownership gap. The Housing Act of 1968 established the Government National Mortgage Association to guarantee mortgage-backed securities. It allowed banks to sell old mortgages and use the funds to create new ones. It expanded mortgage availability, but it also led to the subprime mortgage crisis. In 1965, Johnson sent 100,000 combat troops to Vietnam. By 1968, he increased the defense budget to support 500,000 troops. American casualties grew as the North Vietnamese appeared to be winning. But Johnson wasn't in the war to win it. His goal was to support the South Vietnamese until they could take over the fight. The Vietnam War was the first televised war. Coverage of the gruesome effects of war turned public opinion against it. LBJ soon faced a national anti-war movement. His approval rating plummeted below 30 percent. In 1968, Democratic Senators Eugene McCarthy and Robert Kennedy announced their candidacies for president. Without his party's support, Johnson withdrew from the race. He died of a heart attack in 1973. He lies buried in an oak stand along a riverbed at the LBJ Ranch. LBJ was born on August 27, 1908, in central Texas. His compassion for the poor began as he worked his way through Southwest Texas State Teachers College as a teacher to Mexican immigrants. In 1937 he was elected to the House of Representatives, following the New Deal policies of FDR. He attended but didn't graduate from, Georgetown Law School. During WWII, he received a Silver Star as a Navy lieutenant commander in the South Pacific. In 1948, he was elected to the Senate after serving six terms in the House. In 1953, he became the youngest Senate Minority Leader in history. He became the Majority Leader a year later. He exhibited great skill as a bi-partisan negotiator by enabling passage of the Civil Rights Act of 1957. He also pushed for America's entry into the Space Race. In 1961, Johnson became vice-president under JFK, bringing in the southwest states' votes needed to win. Although never in Kennedy's inner circle, he was in charge of many domestic programs. This included NASA, a nuclear test ban treaty, and civil rights. He also publicly supported sending military advisers into South Vietnam. Johnson's presidential salary was $200,000. That had the buying power of $1.7 million today.